Bike First! is proud to announce that it has received the first inaugural Impact Award from the Multnomah Athletic Foundation, honoring the organization and how it has made a difference in our local community. The Multnomah Athletic Foundation proudly announces the first inaugural Impact Award. Each year this award and an accompanying grant will be presented to a nonprofit organization in the Greater Portland community. This award recognizes an organization that impacts its community through promoting athletic participation. 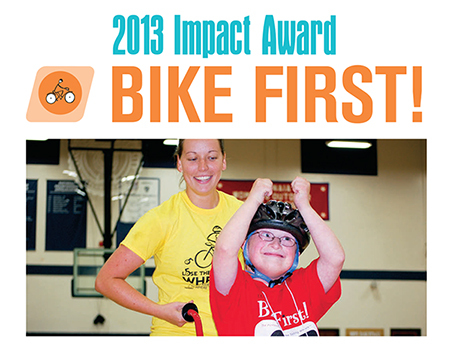 We are thrilled to announce Bike First Portland as the 2013 Impact Award winner. Bike First Portland and NWDSA provide quality learning opportunities in recreational activities for individuals with disabilities. By creating an environment where each person is empowered to maximize his or her individual abilities; everyone can shine! Remember teaching a child how to ride a bicycle? The emotions and sense of accomplishment a child experiences is amazing. Unfortunately, most individuals with disabilities often struggle and fail at this. Through years of research in the elemental physics of bicycle riding, a retired mechanical engineering professor at the University of Illinois built a unique adapted bike that enables the rider and bike to function together as a system. Summer camps in Portland since 2006. Served over 400 children through their programs. Only program that systematically teaches children how to ride a bike. 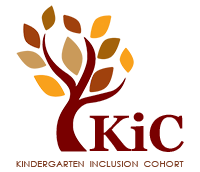 Camp is held on the Concordia University campus from: June 17–21, 2013. To learn more, visit our Bike First! Page.